Forest glass beaker with thread is a historical replica, modeled after old forms and traditionally made. As a decoration and in use, you get a piece of history in your home ambience. Typical properties are the green color and the bubble formation of the glass. Through the manual production each of our glass articles is unique. This forest glass beaker with thread is each through their manual production, a real unique. From the liquid glass- melt, at approx 1150°C takes the glassmaker with the so-called glassmaker- pipe, something glass. 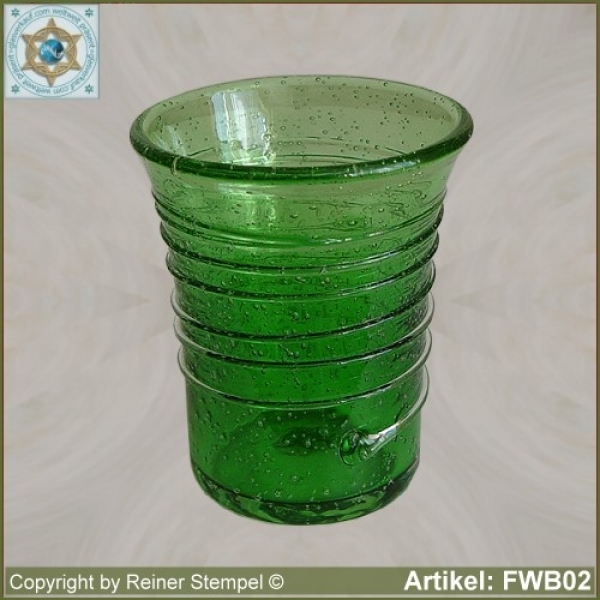 Attention is paid to the green coloring and bubble formation typical of forest glass. Thus prepared, the hot glass is with the glassmaker-pipe through simultaneous forms and blow an glass beaker - shape worked. This glass articles are in front the glass furnace freehand - so without form - blown. Therefore one speaks of free-form glass. Then must the glass egg in the so-called cooling oven and shall at 520°C overnight cooled slowly to room temperature. This is necessary to compensate for material stresses. High manual skills, a good sense of proportion and years of experience with the glass material are the basic prerequisite for the production of our high-quality glass articles. Unbreakable packaging send we our high-quality glass ware to our customers around the world.